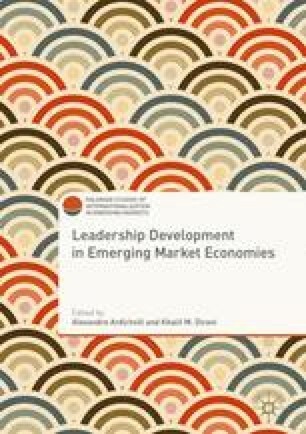 Russia is an interesting case study of a rapid evolution and development of the leadership development (LD) field in an emerging market economy. Compared to the pre-reform time, when there were virtually no enterprise-based, in-house training programs for managers and leaders, today LD has become one of the most important areas of focus of HRD work in Russian firms. To provide an analysis of the emergence and the current state of LD in Russian business organizations, we start this chapter with a brief review of literature on values, skills, competencies, and development needs of Russian business leaders. This review is followed by a section on LD programs, offered by various types of providers. Next, we present the results of our case study research on LD at nine large Russian business companies, representing key sectors of country’s economy. Genkin, A. (2012, June 13). Corporate University: Employer’s choice [in Russian]. Kadrovik, 7. Retrieved from http://www.hr-portal.ru/article/korporativnyy-universitet-vybor-rabotodatelya?page=0.